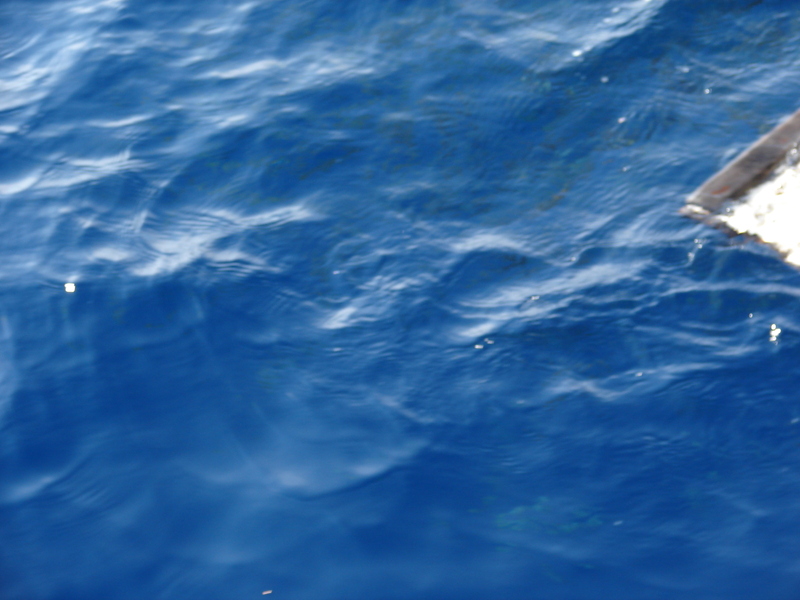 When you fall overboard at sea, the first line of defense is to not fall overboard at sea. We wear harnesses and run jacklines and tie ourselves in and keep one hand for the boat and shuffle and worry and obsess. When you fall overboard at sea, the second line of defense is to hope somebody notices. Whenever one of us leaves the cockpit, we notify the other so that there is a spotter to notice that someone has fallen overboard. But sometimes the other is asleep or whatever. So we bought a Kannad R10. This little gizmo is an AIS/GPS MOB SRS. Automatic Identification System/Global Positioning System Man Over-Board Survivor Recovery System. You install it into your inflatable life jacket. When you fall overboard and inflate your life jacket, it activates and uses GPS to locate it’s position, then broadcasts an emergency device SART (Search And Rescue Thing) AIS signal that alerts every boat within a few miles radius that there is a person in the water, showing their location. 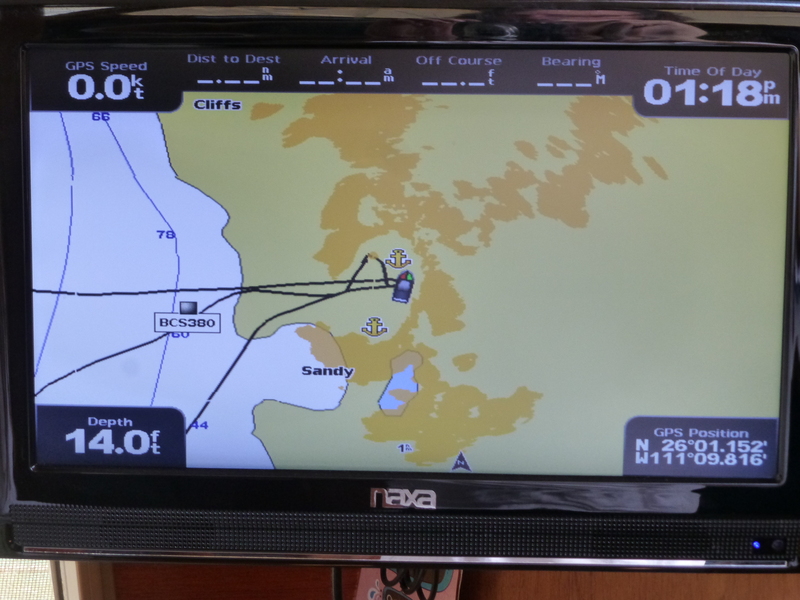 If we get all the gadgets to work right, a very loud alarm will go off on both the laptop and the Garmin Chart Plotter. The person that didn’t fall overboard will then turn the boat around and go back and retrieve the person that did fall overboard. This probably sounds easier than it is. This is all new stuff and pretty expensive, so we only bought one and will use it whenever one person is on watch alone. Hopefully it all works. It sounds good, anyway, which helps with the obsessing part. Puerto Ballandra is one of the most beautiful places in the world. It’s incredibly easy to find, mostly. It’s the little round harbor at the bottom of this island. 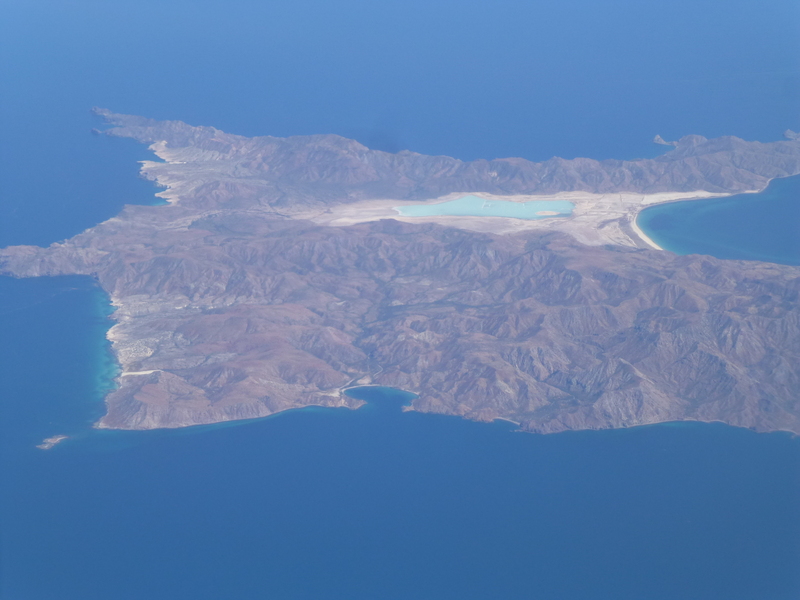 Super easy to find as you fly over it going south from LA to La Paz. It’s easy to find by boat, too, until you look a little closer at the C-Map on your PC chartplotter and find that you accidentally anchored well up a little hill. 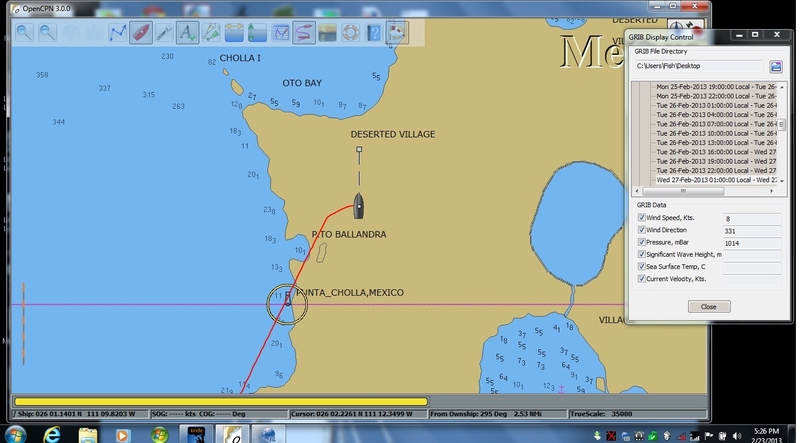 A closer look at the Garmin chartplotter shows a similar problem. The light tan is the charted island, and the dark tan is the radar-indicated actual shoreline. 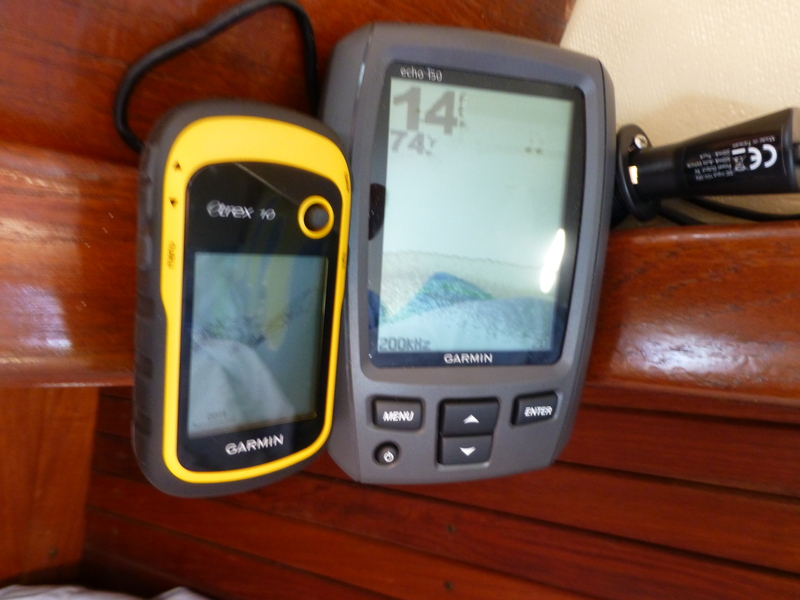 Since the Garmin and the C-Map agree, there must be a problem with the GPS equipment. Somebody should call the Air Force. But wait, what about those anchor symbols on the Garmin Chart? We put them there. Shawn Breeding and Heather Bansmer spent seven years boating around Mexico and finding out where stuff really is. Then they published two great guidebooks to tell the rest of us what they found. Typically they provide a waypoint at the entrance to each harbor, as well as anchoring points within the harbor. It’s completely normal for us to pull into a harbor and find a boat anchored exactly on the waypoint they provided. We used to call their books the pretty books, because they’re full of pretty pictures. On the radio nets here in Mexico, they’re call the Shawn and Heather books. We met Shawn and Heather at the big Seattle Boat show this year, and they’re delightful. So now we call the books the Shawn and Heather books, too. www.bluelatitudepress.com. It’s rare to sleep all night. Every noise, every wind shift, every change is a potential problem. 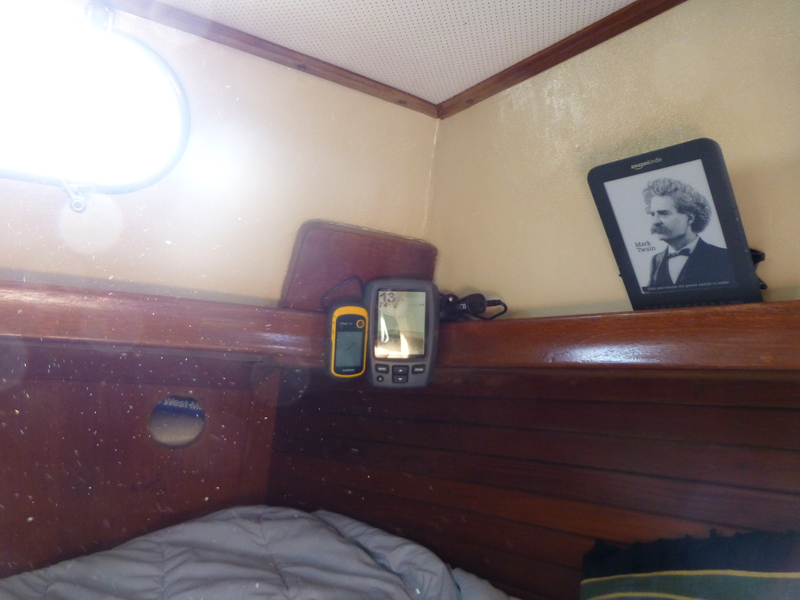 So we installed two inexpensive electronic devices in the (newly painted) aft cabin to help with the status checkage. That way we don’t have to get out of bed and go on deck to check things out. We can stay mostly asleep and completely in bed and still have a reality check. The cheap fish-finder gives Bright Water completely redundant depth sensing capability, plus it’s low-power, plus it has easy-to-use and easy-to-set shallow and deep water alarms. It beeps if we drag off a ledge or into shallow water closer to the beach. It also beeps if we drift over a shallow or deep spot in the anchorage, but we live with that. Older models used to beep if you drifted over a large fish, but this one doesn’t. Better brains. The cheap GPS is another completely redundant locator system (six, I think) for the boat, but all this one does for us is forever draw a “bread-crumb” trail of where we are and where we’ve been. Swinging on the end of the anchor chain draws a smile, while wandering through the anchor zone draws a roundish bird’s nest. Both are fantastic. Dragging the anchor in a strong breeze or current draws an unmistakable zig-zag of impending disaster. We don’t use a digital (number-only) depth gage because these are often fooled by layers in the water caused by temperature or salinity differences (thermoclines or underwater springs, for instance). We also have windows we can look out. Those are good too. …even though it is a fish story. We blew it when we left Ensenada. 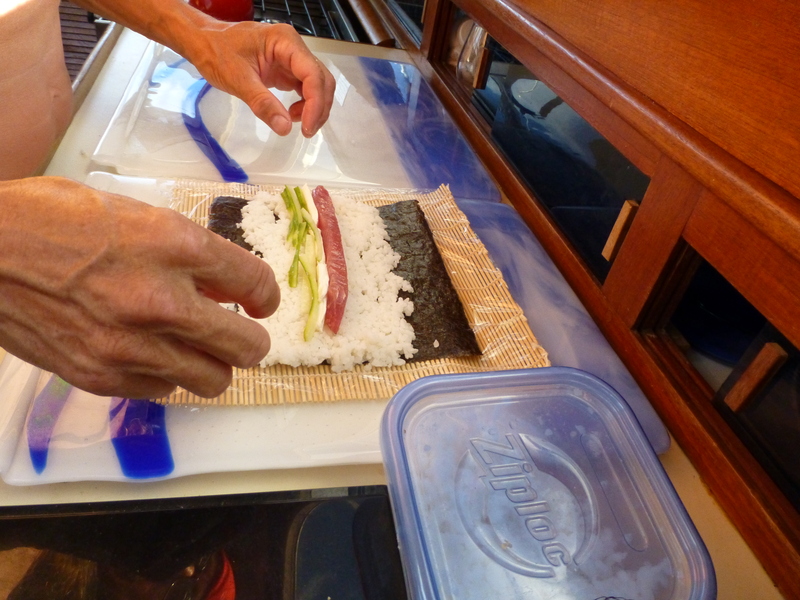 We cooked rice and added sugar and rice vinegar to make it all sticky, and we bought some nori in San Diego, but we left in a rush and didn’t get the Spam fried and the musubi made. So no road food. So we put out a lure and caught a tuna. Skipjack, maybe. 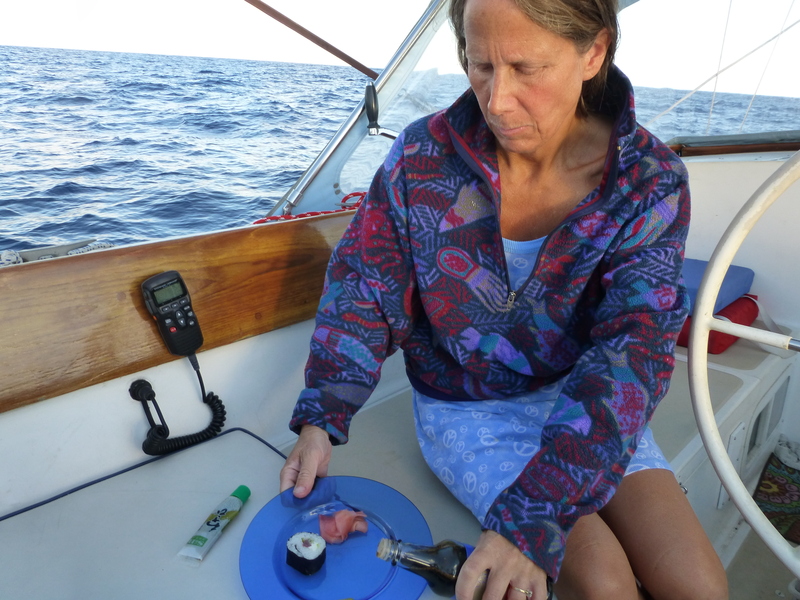 Whatever kind of tuna that takes the lure right after you give up and find something else to do. Very, very easy to filet, by the way. Very soft bones. Fresh sushi in the cockpit. Almost as fresh sushi the next day, as well. We also had a very nice raw tuna/spinach salad with raspberry dressing. Then we got a little greedy and decided we wanted Dorado, which is way, way better than tuna even though it’s better cooked. But there was a little problem. 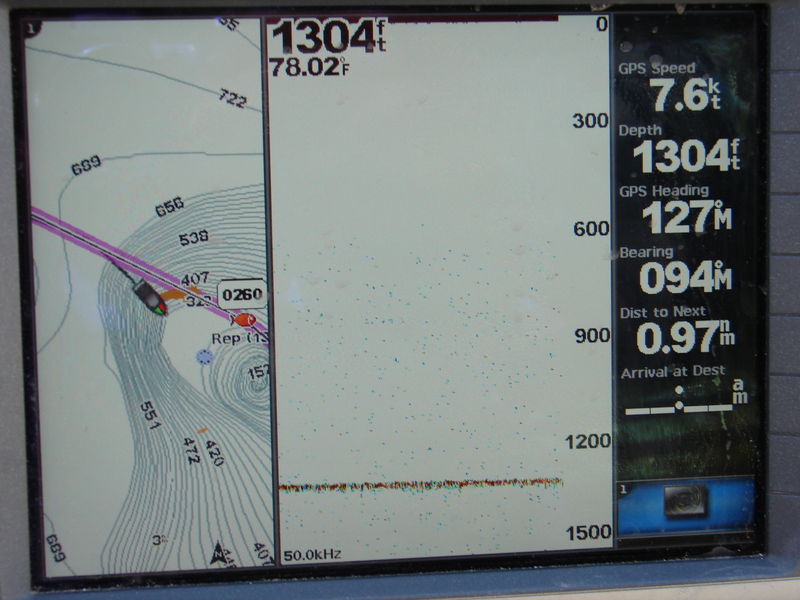 This is a shot of our split-screen plotter/depth sounder. 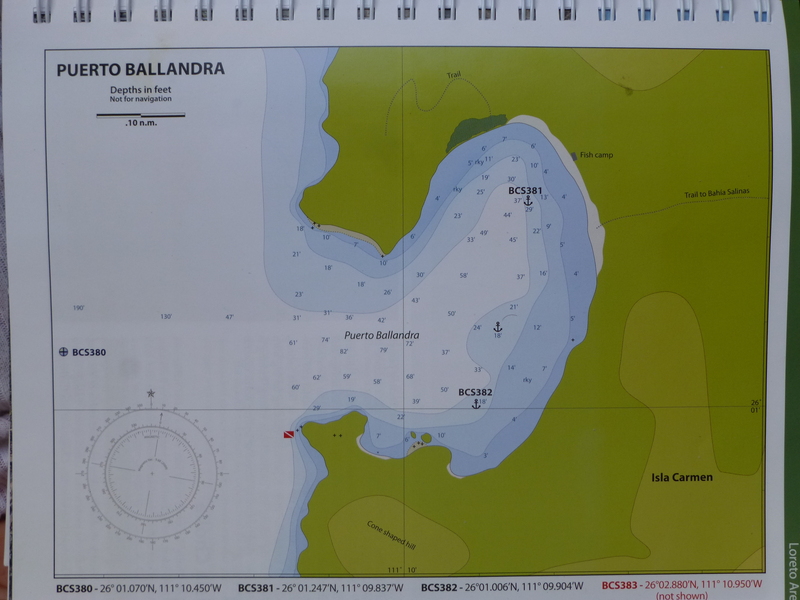 The chart plotter shows we should be at about 450 feet, climbing an incredible sea-mount in the middle of nowhere. The actual depth is shown on the right. Clearly the charts aren’t even close. We looked around for a while but never found any structure. 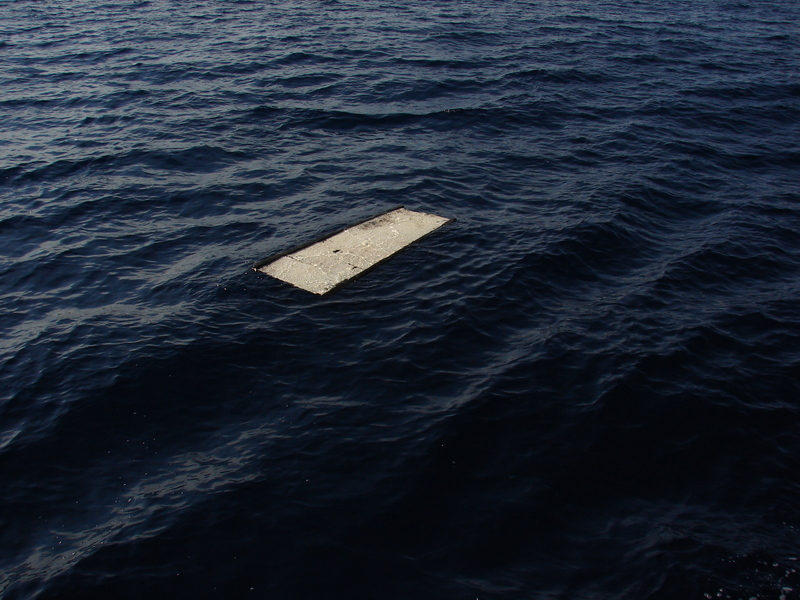 Twenty miles offshore we found this 2×4 foot piece of plywood float all alone. An entire ecosystem had formed on the plywood. The dark cloud on the plywood are small black fish. There is a huge school of sbf living in the shade of the plywood, probably feeding on the algae growing on its bottom. Right below the school of sbf are hungry dorado and wahoo. The dark cloud on top of the plywood are fish trying to stay in the tiny wavelets that wash over the board. It’s safer on top, you see. 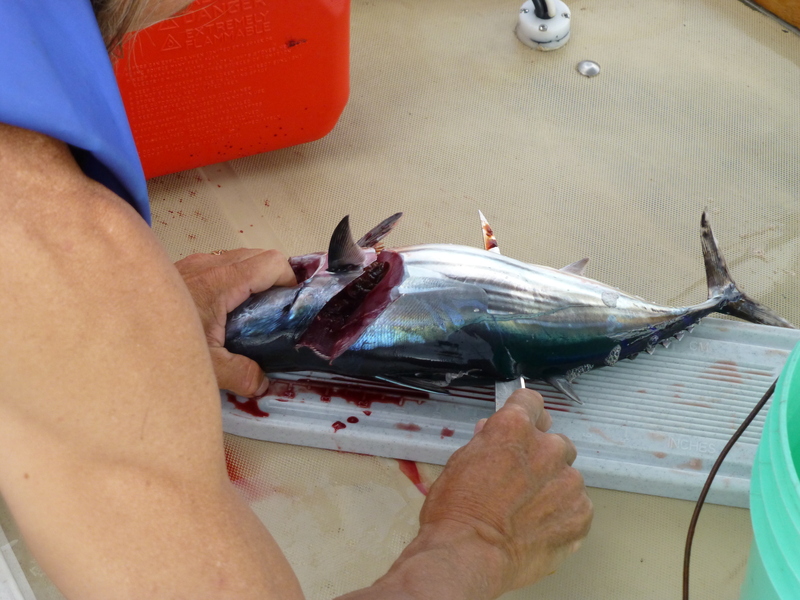 Of course, below the small dorado and wahoo are larger dorado and wahoo, etc. I’m sure there are sailfish and marlin below them. So we dragged our lures next to the board for an hour and a half or so. We caught and boated two wahoo, and hooked and snapped off two four-foot dorado. We need bigger fishing stuff. A huge school of dorado would follow whatever we hooked right up to the boat. They’re incredible underwater, blue and green flashing, but without a polarized filter on the camera the pictures didn’t turn out. The wahoo is good, like fresh-water perch, but not as good as dorado. Good tacos, good fish sandwiches.